While this year's efforts to honor veterans is past, we've 12 months till we do it again. How will you use that time? I spent three years in the Army in the late 1960s, serving in Military Intelligence. I'd studied history in college prior to joining the Army, so I understood the role of collecting best available information for leaders to use in making decisions. 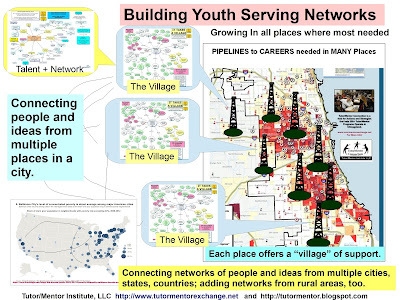 Over the past 40 years I've amassed a large web library, that anyone can use to build and sustain volunteer-based programs reaching k-12 youth living in high-poverty areas of big cities. 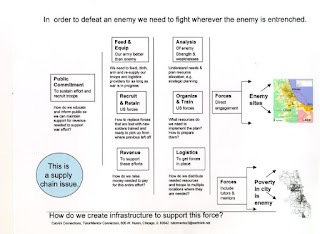 Every November since starting this blog in 2005, and in the months in between, I've posted articles that call on veterans and active duty service men and women to use the skills they have learned to support an "intelligence-based" effort that fills high poverty areas with needed programs, and helps each program get the on-going flow of resources each needs to constantly improve their ability to help youth overcome the challenges of poverty as they move through school and into adult lives. This map visualizes this process. You can find an explanation of the graphic here, and here. 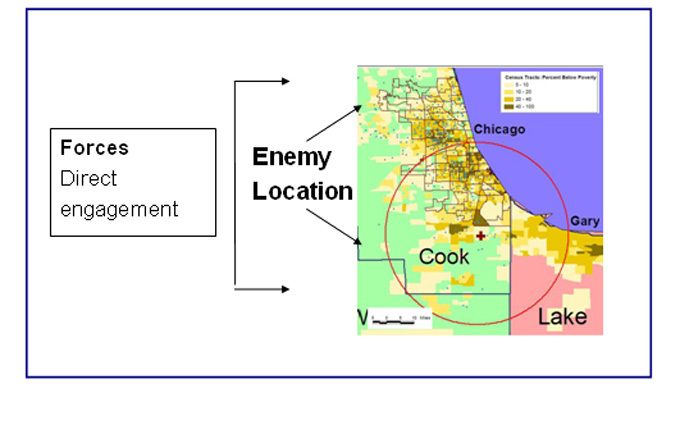 On the right hand side of this graphic I emphasize the use of maps. 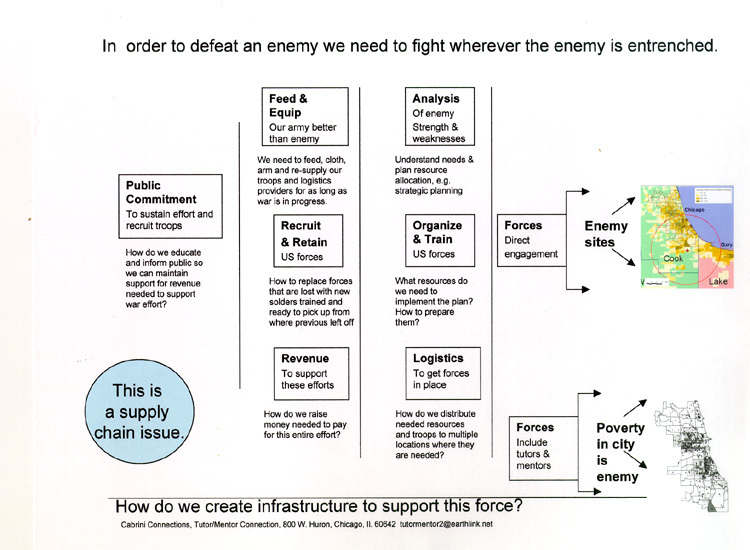 Unless leaders use maps to show all of the places within an urban area where poverty is concentrated, and where other indicators show a need for extra support, it's likely that strategies will only reach a few places, not every place where help is needed. 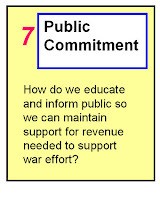 Step 7, on the far left, is equally important. 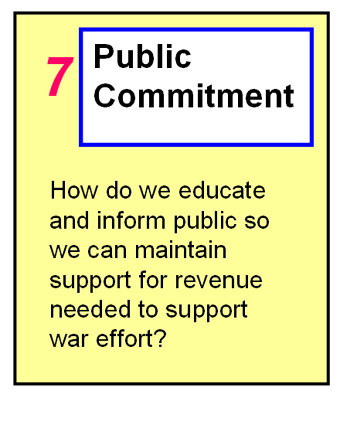 Unless we focus on ways to build and sustain public support for this strategy, the flow of resources to all of the programs that need to be involved will be too small and or discontinued too soon. Here's an article I wrote about building public will recently. I hope you'll look at it. Steps 2 through 6 are on-going, but they involved building a deeper understanding of the complex challenges of reaching youth in all parts of a geographic region with a wide range of supports that help them move through school and into adult lives. This deeper learning extends far beyond understanding how to be a tutor or mentor, or how to organize and lead a youth serving organization. 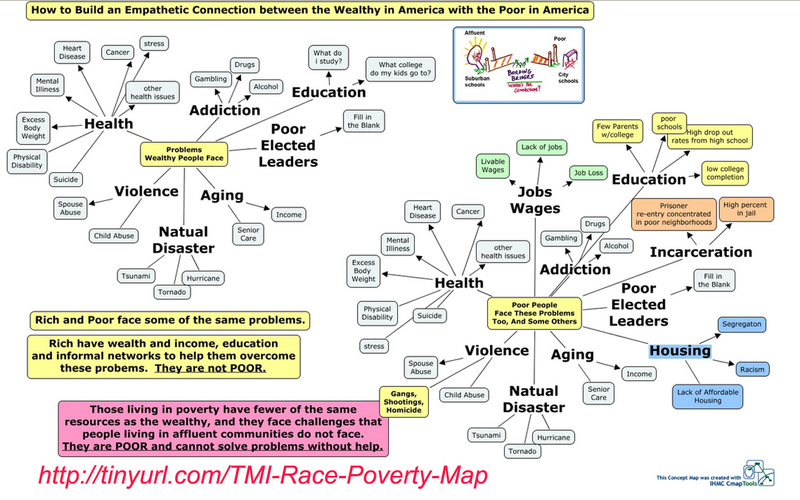 I encourage you to look at this graphic which shows that affluent people face many of the same challenges as people living in high poverty. 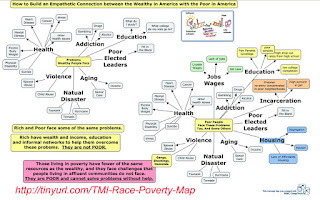 In this book titled "Our Kids: The American Dream in Crisis", Robert Putnam, see my article, shows that kids living in affluent communities have many more resources available to help them and their families overcome their challenges. Youth living in high poverty communities not only have extra challenges, but have far fewer resources to help them and their families overcome those challenges. 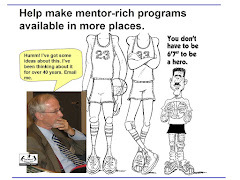 When I describe a Total Quality Mentoring program, I'm thinking of programs where some volunteers take on many roles beyond acting as a tutor or mentor. This PDF focuses on the extra roles volunteers might take to help youth and families overcome more of the challenges shown on the graphic above. There is no limit to what things a team of planners might look at. TQM programs are learning organizations where youth, volunteers, staff and leaders are constantly reading research and looking at work being done in other programs, with a goal of constantly innovating ways to help youth stay in school and move toward jobs, which means they also are looking for ways to engage a wider range of volunteers who can model different types of careers, and who can open doors to part time jobs, internships, vocational training and college as youth grow up. A TQM program offers a network of support, via the Internet, that can last a lifetime. A TQM program also shares its own ideas, strategies and challenges on its own web site so others can learn from them while they are learning from others. 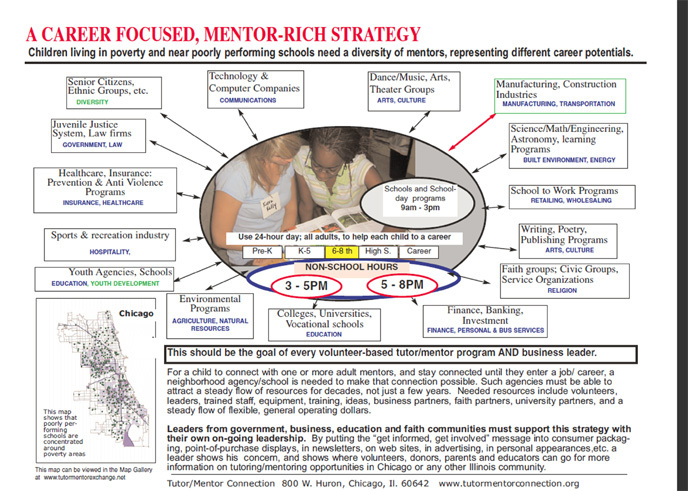 I don't know how many programs in Chicago, or around the country, actually fit this TQM Program description, and have never had the manpower to do the on-going searching to find out which programs already operating in Chicago have the vision and strategy that heads them in this direction. It's the type of program I led between 1993 and 2011. Understanding where services are needed, and what types of services need to be available within a geographic area is one challenge that planners and "intelligence gatherers" need to focus on. However, another challenge is to understand the infrastructure that is needed to support effective on-going learning and mentoring within every organized tutor/mentor program. Understanding the different functional roles that need to be filled enables intermediaries, donors and third party supporters help provide this talent, and keep it in place for many years. I want to end with a though that addresses the talent and manpower needs within the youth serving world. I encourage you to view this presentation and think of how veterans could fill many slots, in many different tutor/mentor programs, and how other veterans working in various industries and professions could support them on an on-going basis. 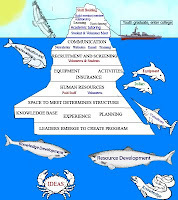 As planners look for ideas the articles I've posted on this blog since 2005 and the ideas I share in the Tutor/Mentor Institute, LLC web site and library offer an extensive source for deeper learning and inspiration. 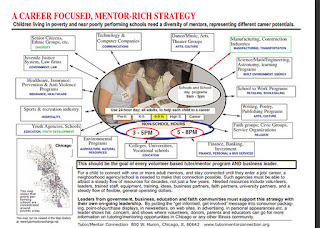 Building a network of mentor-rich, Total Quality, youth serving organizations that reach youth in all poverty areas of big urban areas like the Chicago region, offers job and career opportunities for thousands of veterans, while also providing a support system that helps more youth move from poverty neighborhoods into a wide range of jobs and careers, including careers in the military. This year's Veteran's Day celebration is over. I hope you'll spend time over the next 12 months looking at this and other ideas for ways veterans can continue to serve and make a difference in the world. If this article resonates with you, please visit my FUNDME page and make a contribution to help me keep sharing stories like this, while also maintaining the resources on the Tutor/Mentor Connection/Institute, LLC's web sites.